Oh man have I been sitting on these swatches for a long time. I picked these up the week before they came out, if you can believe it! And yet I'm only getting to them now. :/ Bad blogger! Anyway, now that you're here and I'm here and the swatches are here we can take a look! 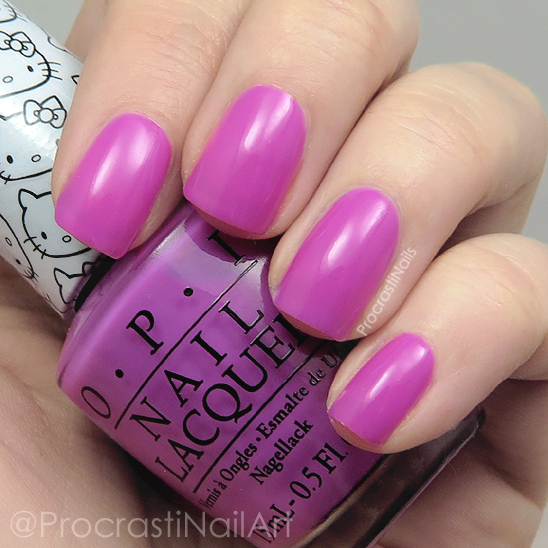 These are my top picks from the OPI Hello Kitty Collection! 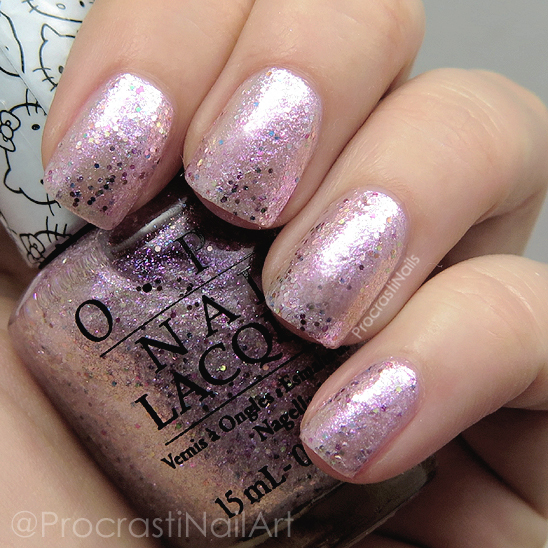 First up is a bit of a cheat because I've actually shared these swatches on their own before... Shh! Haha. This is OPI 5 Apples Tall and it's the only non-pink I picked up. 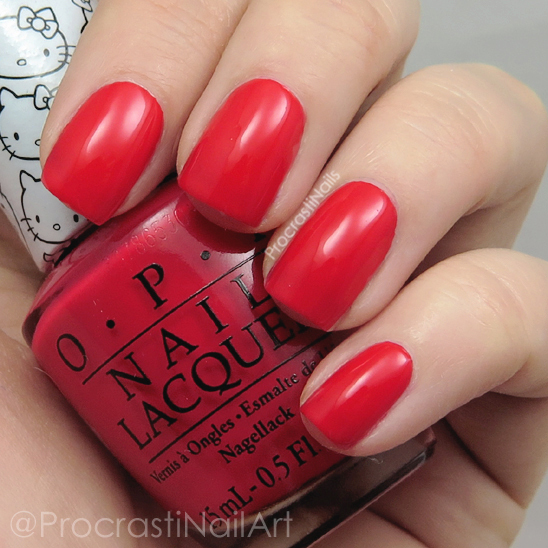 It's a stunning a bright apple red creme that leans ever so slightly slightly pink. This one applied wonderfully and what you see here is three coats with top coat! This is three coats without top coat and as you can see it's still quite sheer. You could def add different coloured undies to change this one up if you wanted! Everyone knows I'm a sucker for a good pastel, and OPI Let's Be Friends! is right up my alley! It's a pale pink creme that just screams at me to be paired with a good tan this summer. Unfortunately this one was the biggest pain out of the lot to apply - what you see is three coats and even though these pictures hide it well it was still a wee bit streaky. The name of this one actually has a heart symbol in it but I have no idea how to make that with my keyboard so you get it spelled out for this review. 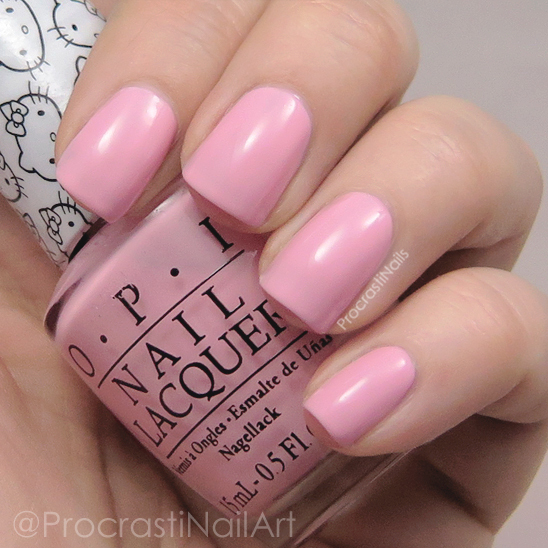 This is OPI Small + Cute = Heart and it's another favourite for me from this collection. It's a soft cotton candy pink creme and applied really well with three coats. This is the perfect level of girly for me! And our second glitter of the post! 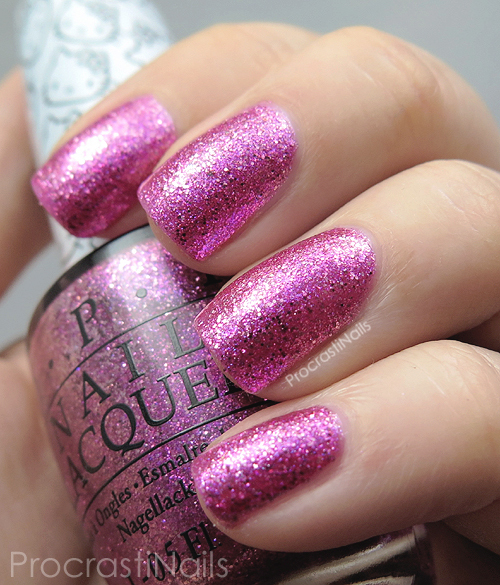 This gorgeous stunner is OPI Starry-Eyed for Dear Daniel and it's a bold magenta microglitter in a pink jelly base. I was worried this one would be a bit sheer when I first picked it up but as you can see you will have no trouble building this one up to full opacity! Pictured here is three coats with top coat. 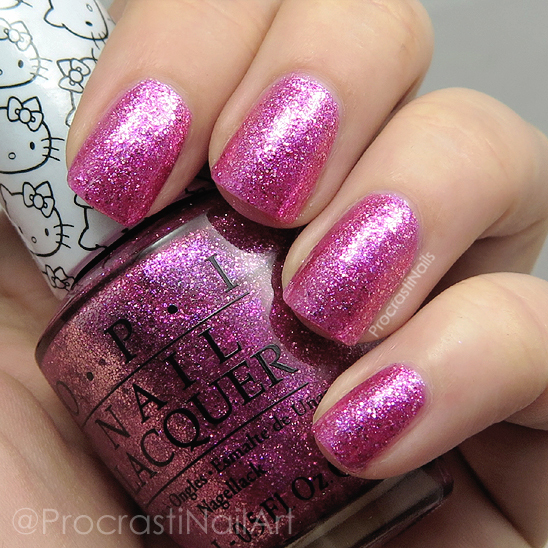 And last but not least is OPI Super Cute in Pink! This is a bit more of an orchid than a true pink in my books, but it's still lovely either way. I feel like this one wants to be a creme but in reality it's more like a really opaque crelly. Either way it applied really well, and what you see here is three coats with top coat. Believe it or not, this was not completely a pink-heavy collection. There was a black and a blue and a yellow and... Okay, and a fair number of pinks. But my point is that's not all there was! And yet that seemed to be what I was drawn to. Go figure! 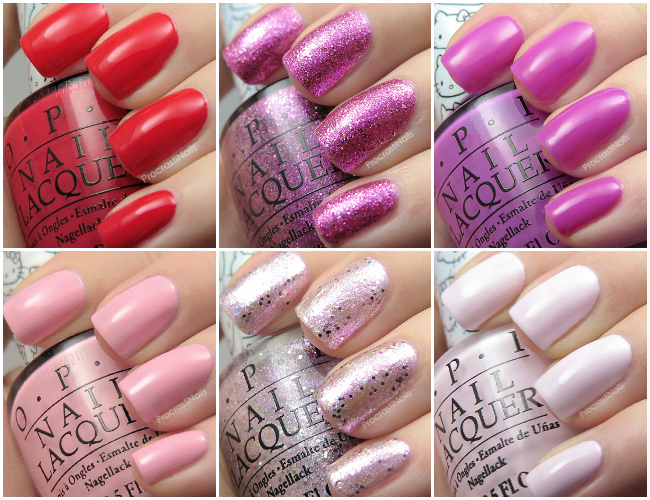 My favourites from these shades were the soft pastel pinks - Let's Be Friends! and Small + Cute = Heart. I also really like Starry-Eyed for Dear Daniel. Honestly though, I think the whole collection is awesome. And it's been a while since I've been able to say that about a mainstream collection! Which is your favourite from this set? Is there one you think would be best for me to wear for the (upcoming, hopefully!) gorgeous spring weather we have coming just around the corner? Nice swatches of them. There such fun girly shades. Beautiful swatches!! Charmmy & Sugar is stunning! Those creams are to die for colors! Oh these are so wonderfully girly! I love 5 apples tall and super cute in pink the most, I think. At first I didn't seem to like this collection but it's growing on me more and more now! I love charm my & sugar, it's adorable! I was not sure how I would like this collection when it released, but I fell in love with it! I have worn every color in the collection multiple times since I got them!